Genetically Modified Organisms-- or GMOs-- are present in the vast majority of processed foods found in most stores around the country. The Grocery Manufacturers Association estimates that between 75% and 80% of all processed foods available on grocery store shelves contain GMOs. This makes things difficult for people who are trying to figure out which foods contain GMOs, but there are a few specific issues to keep in mind. Currently in the United States, companies are not required to tell you if there are GMOs in the food they sell. Pushes to require labeling of GMOs in the United States have often been shot down due to the legalized "personhood" of corporate entities through US courts. This personhood has given corporations the same free speech rights as living, breathing human beings. These rights extend to the right to not speak, which has been invoked as a constitutional basis for rejecting mandatory labeling. This means that you will never be 100% sure that a company uses GMOs unless they tell you. GMOs have been either banned or labeled in many countries. In these countries, you can easily tell which foods have GMOs in them. If you live in the United States, however, you have to go out of your way to find this information out and you may never be 100% sure. The USDA states that roughly 94% of soy and 75% of all corn manufactured in the United States is genetically modified. 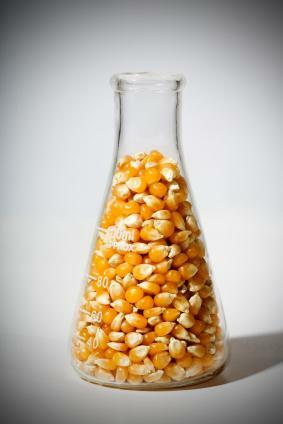 GM corn is commonly used as an animal feed and in the production of high fructose corn syrup. According to Sweet Surprise-- a high fructose corn syrup ad agency-- high fructose corn syrup is in everything from baked goods to yogurt and frozen fruits. Soy is a commonly used source of protein in vegan and vegetarian foods. Avoiding corn and soy products that are not explicitly labeled as 100% Organic is a good first step in avoiding GMOs. According to the USDA Organic Program standards, organic foods cannot contain any genetically modified organisms. However, a company can still market a product as being made from organic ingredients while using some GMOs. If it is not labeled as being 100% organic, then it is likely to only contain a mixture of organic and non-organic agricultural ingredients. There are also a number of labeling initiatives that give manufacturers the opportunity to distinguish themselves as GMO-free companies. The Non-GMO Project is a voluntary labeling initiative that inspects the products of companies to ensure that they are free of GMOs. Since corporations are not required to divulge whether or not they use GMOs, the best resources out there will still only be able to tell you whether companies potentially use GMOs. The Organic Consumers Association has created a shopping guide that is available for free and offers a list of companies that are verified GMO-free and companies that potentially use GMOs. They contact companies individually and ask about specific brands while creating this guide. Companies that choose to not answer are placed under the heading "may contain GMO ingredients." In the end, there is no verifiable, authoritative, or comprehensive list of foods that absolutely contain GMOs. The best thing you can do is research the food and make a judgment call based upon what you see. The only certainty in this field lies with organic foods and they are the only way to be 100% sure that you are not eating GMOs.